The sight of a foreign tramway car (Brill type semi-convertable No. 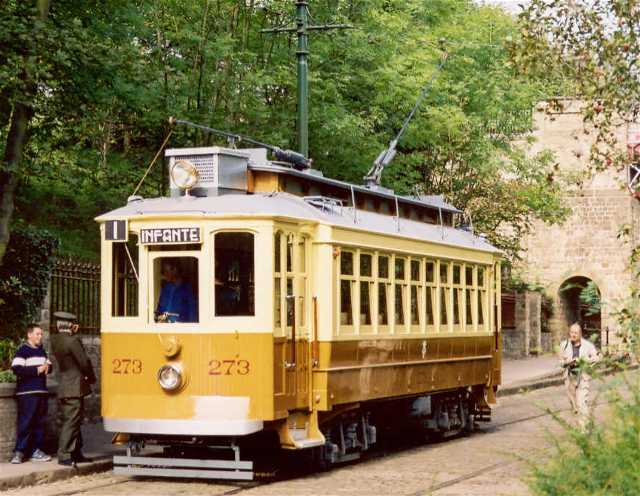 273 from Oporto in Portugal) on a hillside site on the edge of a Derbyshire village is, to say the least, unusual. 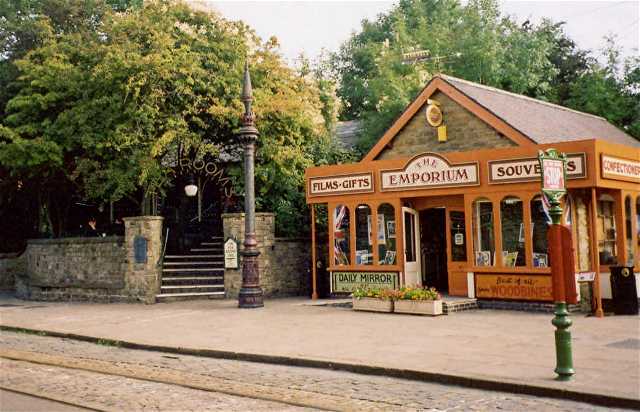 The Crich Tramway village is the home of The Tramway Museum and its very comprehensive collection of modern, vintage and veteran town and inter-urban tramcars from many parts of the world. The museum has a demonstration tramway of about half a mile and visitors are offered a traditional penny ride. The museum provides an extensive operational tramway depot that offering secure covered accommodation for the fleet of operational cars as well as workshops for repair and restoration. There is also a fine exhibition hall where exhibits trace the development of the urban tramway and rapid transit systems down to the present day. The Red Lion Public House below is just one of the buildings that line the street and provide an authentic setting for the street tramway cars. 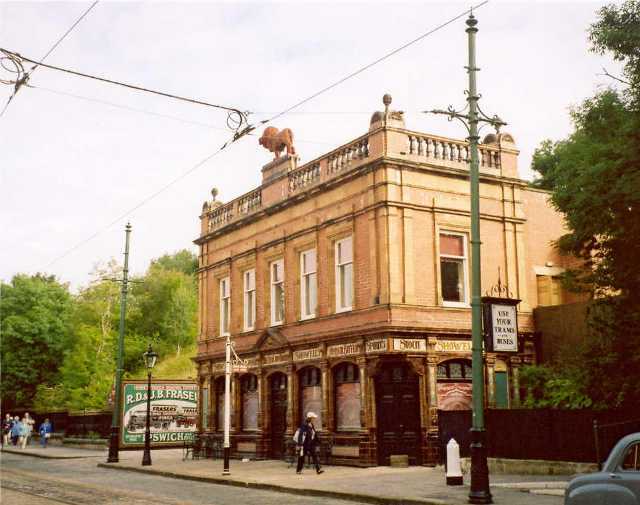 The Red Lion stood opposite the Potteries Electric Traction Tramway Depot in Stoke-on-Trent and outlived the tramway by many years. The Red Lion was much frequented by tram staff and later by the PMT bus staff who took over from the PET in the 1930's. 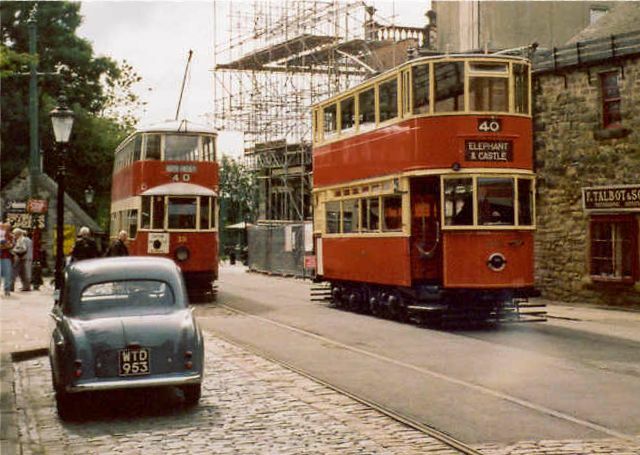 It finally closed in 1973 to allow for street widening but it was carefully demolished brick by brick by members of the Tramway Society and was eventually rebuilt at Crich using original materials wherever possible and reopened in 2002 at a cost of £500,000. This famous tram is unique, the prototype for a fleet that was never built for the Metropolitan Tramways of North London. London United Tramways had a fleet of very similar cars but they had entrances at the ends. Centre entrance trams were seen as an ideal design yet few were built in Britain. Only Blackpool had, and still has, a large fleet of central entrance trams. 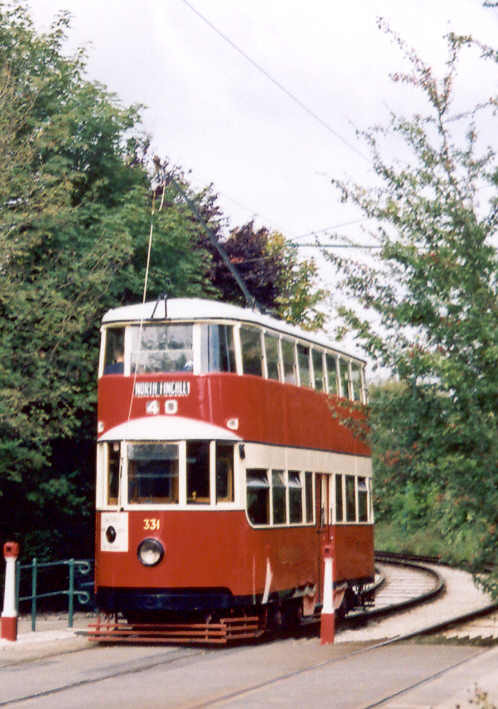 London Transport replaced most of the North London tram routes with trolley buses and this tram was sold to Sunderland Corporation where it ran until that system closed in October 1954. The writer remembers it well in 1950 in the main streets of Sunderland. London County Council Tramways operated in South London and outlived the North London Lines by over 20 years, the last were closed and replaced not by electric trolley buses but by the London Routemaster diesel bus. Hidden in the trees by the souvenir shop is a country café in the "Teas with Hovis" tradition. Photographs © 2002 by Noel Walley.